Confetti Coleslaw is complex, colorful and assertive. 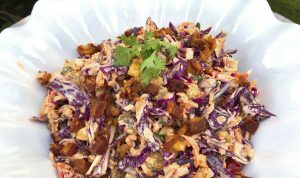 The purple cabbage, carrots, sweet peppers and onion are the perfect base for a veggie slaw that is dressed with barbecue flavors and a hint of smoky pancetta. 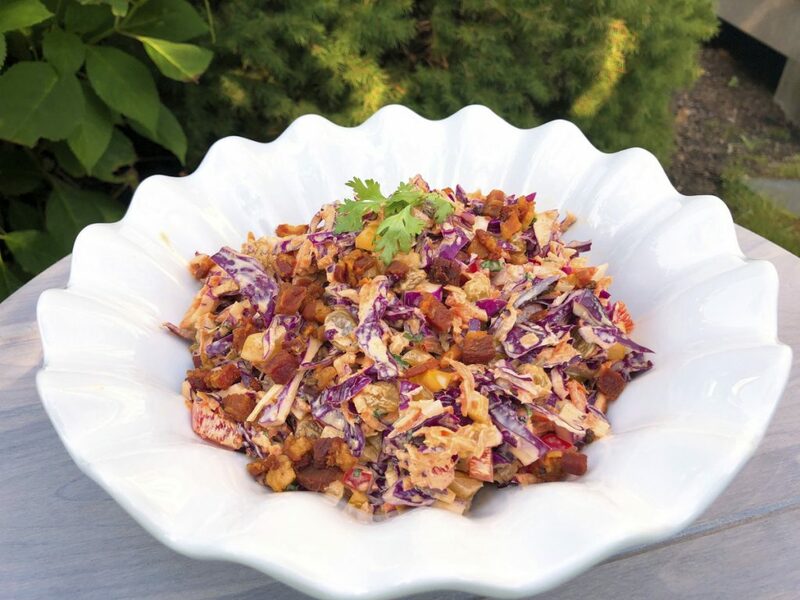 I originally created this Confetti Coleslaw to go with a meaty chili, but it is the perfect side dish for ribs. It is vibrant and pleasing to the eye, it is chock-full of veggies, and the dressing is spiced with cumin, paprika and cilantro which are perfect companions to rib spice-rub that almost always includes cumin and paprika. NOTE: If your slaw seems dry, you may need more dressing. This will happen as the size of vegetables vary. You can double the dressing ingredients to make more, but let the slaw sit before adding more dressing because you don’t want to over-dress it.